The devil comes knocking… and is most welcome! While piering over the edge of a dock, taking pictures and looking for an invasive (but beautiful) marine bryozoan, I saw a flash of dark. In the second that followed, my first thought was a large salmon, but its movement was too fluid and agile. My next thought was small seal, but the shape and size weren’t right. Since I had my camera in the water, I pointed in that direction and took a shot. An instant later, the flash opened like a parachute and came to an abrupt halt a dozen feet from the water’s edge. 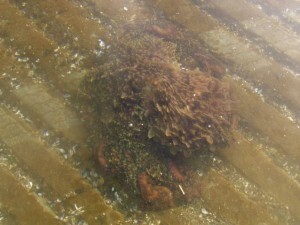 The octopus changed colors in two quick waves before dashing under the dock. I was afraid that was the last I’d see of it, but it then “tip toed” (for lack of a better description) with much less urgency across the boat launch to the next dock. This was an odd time and an odd place to find a giant Pacific octopus (Enteroctopus dofleini) which is generally nocturnal and spends the day in their favorite crevice. Particularly before recreational diving came into being, it’s easy to imagine how tall tales grew out of the existence of such a terrifically unusual creature. I have an old marine biology text, where the author refers to our Pacific Coast species as devilfish (not uncommon still today). At the same time, the author decries the misnomer and describes the creatures in colorful language not found in modern textbooks. The fear people had of old was clearly derived from ignorance. It was not unusual for the octopus to be depicted with pincers at the end of its arms or other nightmarishly concocted details. Today… many divers consider encountering these intelligent creatures like bumping into an old friend – except the friend’s under water… and doesn’t actually get very old (only 3-5 years!). I mentioned above that this octopus changed its color. For a creature with so many striking features, this is probably one of the most impressive. Octopuses and their kin (squid and cuddlefish) have four types or groups of cells that can influence their color. The most useful for this octopus is the chromatophore. The pigment-containing chromatore cell is surrounded by more than a dozen muscle cells and at least one nerve cell to trigger an instant contraction or relaxation of the chromatophore, thus changing the visible pigment. 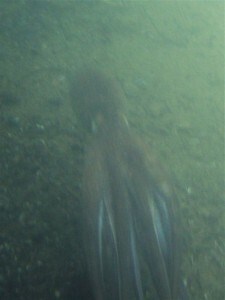 In the image to the left you can see the shudder of light running across the octopus. Other amazing features include their beak, their suckers, their lack of many hard parts, their diet, intelligence, ink, hydropropulsion, fishing pressure …). Maybe I can blog about those later. We have two octopus species in the shallower waters of the Pacific Northwest – The giant Pacific and the Pacific red octopus (Octopus rubescens). The red is small (up to 20″ with arms spread), while the Pacific giant can reach 160 pounds and stretch their arms 24′! Much larger individuals are thought to exist. 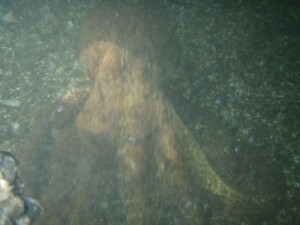 The octopus in these photos was a more modest size – 3 or 4′ while swimming and basketball sized while walking. Other identifying features include lots of flat, rounded skin flaps on the giant Pacific and more cylindrical, pointed skin flaps on the red. Also, the red has three skin flap eyelashes just below each eye; the giant Pacific has none. Divers enjoy regular visits with giant pacific octopus, but for those who don’t get more than wader deep in the water, it’s worth keeping an eye out for them when you’re exploring the intertidal, particularly in rockier areas. They can survive for some time out of water as long as they stay cool and damp. To get a wonderfully close look at these critters, check out the Port Townsend Marine Science Center or Seattle Aquarium. Octopus week at the Seattle Aquarium is coming up (2/13 – 2/20). A highlight is the annual Valentine’s Day “blind date”. A male octopus has already been introduced into the tank with the female, but they are currently separated by a perforated gate. The holes allow them to sense each other but not to come into contact. At noon on Valentine’s Day the two will be allowed to meet in octoperson. On the Kitsap Peninsula, the Poulsbo Marine Science Center is a fabulous place to visit an octopus and enjoy other marine life. Currently “Mr. Bob” is the resident octopus. You can see a couple pictures under News on the PMSC website. Exploring the Center is free of charge and the doors are open 11-4 Thursday-Sunday. Jeff Adams is a Washington Sea Grant Marine Water Quality Specialist, affiliated with the University of Washington’s College of the Ocean and Fishery Sciences and based in Bremerton. You can follow his Sea-life blog, email to jaws@uw.edu or call at 360-337-4619.
wonderful blog – thank you! !